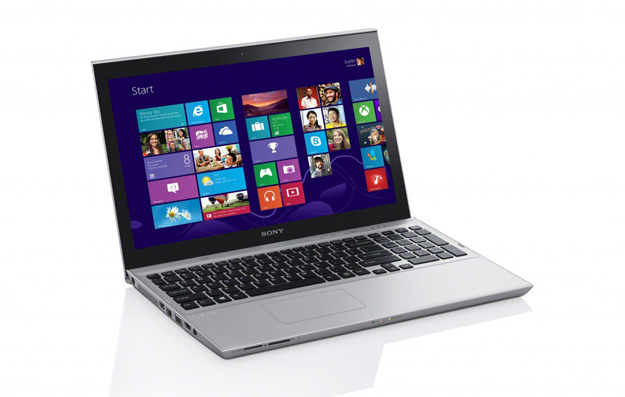 Check out our review of the Sony VAIO T14 Touch ultrabook. Ultrabooks are ultra slim, ultra lightweight, and known for their easy portability. As a result, most of them feature screens in the 11- to 13-inch range. Sony’s decided that it’s time for a change. At CES this year, the company announced two new Ultrabooks sporting 14- and 15.5-inch screens, the VAIO T series 14 and the VAIO T series 15. At that time, we heard they’d be available in the spring, but it looks like these VAIOs are early. Both Ultrabooks are available to order now. Starting at $950, The VAIO T series 15 features a full 1920 x 1080 HD touchscreen for both excellent Netflix viewing and a solid Windows 8 touch experience. The VAIO T series 14 features a lower 1366 x 768 resolution, and the 14-inch display is available with or without a touchscreen. The T series 14 starts at $900. Both starting configurations come with a Core i5 processor. Of course, they can be upgraded to i7 processors for those willing to shell out the dough. Both Ultrabooks are available with a dual drive option that pairs a fast solid-state drive with a larger traditional hard drive. The 24GB SSD handles the operating system, and the traditional hard drive holds photos, videos, music, documents and other programs. But, if speed is super important to you, you’ll want to upgrade from a regular hard drive to a larger SSD. Sony has 512GB and 1TB sizes available as options on the T series. Sony is marketing these big screen Ultrabooks to students and professionals, which may help explain why both models come equipped with a CD/DVD drive. Once a standard part of every computer, the drives are becoming more of a rarity as laptops grow thinner. The laptops also include up to 8GB of RAM, a webcam, USB 3.0 ports, HDMI, and an SD card reader. Both are available worldwide starting today.